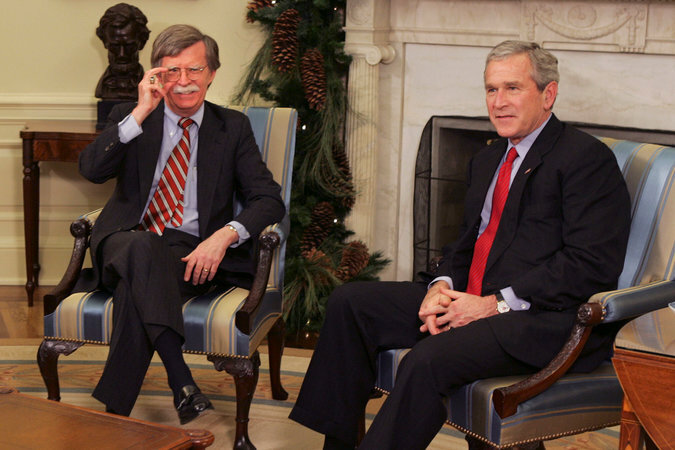 “Now that John Bolton has finally ascended from the limbo of the green room to the Valhalla of the White House, we need to settle the first question of his tenure: Is he a “neocon” or a “paleocon”? I have seen both terms used, the former more promiscuously, to describe Donald Trump’s new national security adviser. But they’re both misdescriptions, and explaining why is a useful way of putting Trump’s foreign policy team (and its distinctive dangers) in intellectual and historical perspective. Foreign policy conservatives can be grouped into four broad categories. The first group, the genuine paleocons, are the oldest and least influential: Their lineage goes back to the antiwar conservatism of the 1930s, and to postwar Republicans who regarded our Cold War buildup as a big mistake. “A Hawk Takes Flight,” by Ross Douthat, MARCH 24, 2018 is brilliant, thank you. I, am a foreign policy historian and analyst, but this piece was full of delineations I had never heard, and which were cleaner than any other I’d seen. It reminds me of the analysis of John Lewis Gaddis, in his history, “The Cold War” which I studied at Yale. Most writers don’t mention the paleocons, who coined that phrase and definition? Back in the 1970’s, they were referred to as the isolationists. The piece is so dense, I read it out loud to my business consulting and life partner Kathleen Schomaker. Since her expertise is environmental policy and science, she couldn’t follow it all, so we read it aloud a second time, parsing each difficult new definition. It all held up. Douthat is capable of making his readers smarter and better informed. I am sorry the NYT closed the on-line comments before this Monday morning, because I couldn’t find a singe comment that liked or appreciated this deep analysis. The commentors screamed and scowled at Douthat for not focusing on the cost of Iraq and Afghanistan, and that a large number of the policy makers didn’t serve or have their children serve in these ill-conceived adventures. As I have written many times before, they criticized the writer for what he didn’t include in his 1500 words, instead of addressing what he chose to write about. They dismissed the analysis as moving furniture, when it actually described the zoo and its animals and how they see the world. That they were mostly draft-dodgers is true, but off subject, and certainly doesn’t describe General Eisenhower. The piece was extremely useful, if you really want to understand who the players were and how they differed in profound but measurable ways. It left me wanting Part 2. Please apply this analysis to the Democrats. Please expand to write about Roosevelt, Truman, the Kennedys, Johnson, Carter, Clinton and Obama. It seems to me that Bill Clinton was most like the neocons in this op-ed, but left of center. What term do you use for him and his action in Bosnia, a neocon who was actually successful? Wasn’t Roosevelt a foreign policy realist? This entry was posted in David Lindsay, Foreign Affairs and U.S.ForeignPolicy, Ross Douthat and tagged A Hawk Takes Flight - by Ross Douthat - NYT. Bookmark the permalink.